Contributed by Linda Fisher, the gggranddaughter of Edna Wheeler Hopkins. Joseph Jay Hopkins married Edna Wheeler on 21 September 1870 in Knoxville. 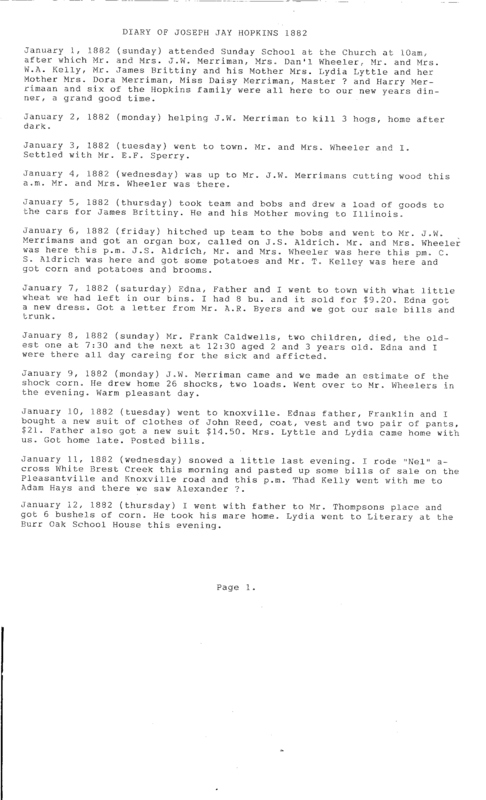 This diary records the last weeks before the family moved on February 2, 1882 to Hillsdale County, Michigan. On February 23 they bought 80 acres of land in North Adams from Joe Baker. Photos of Minnie Hopkins' Birthplace in Marion County. Minnie was the child of Joseph Jay and Edna Hopkins. 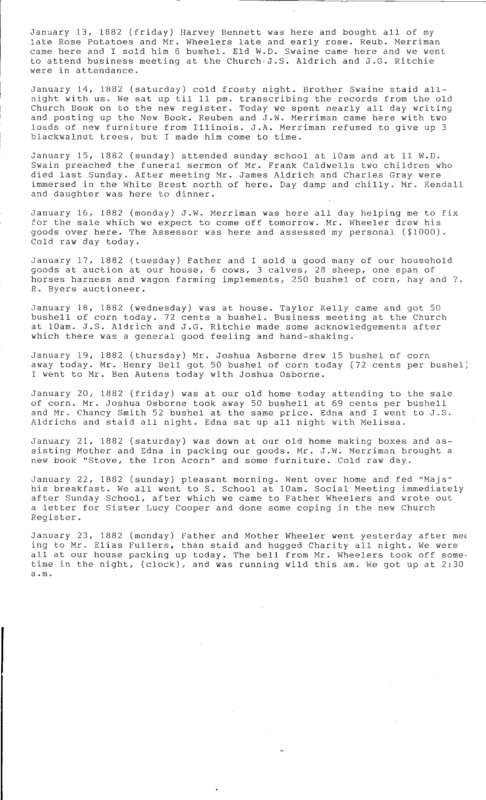 January 1, 1882 (sunday) attended Sunday School at the Church at 10am, after which Mr. and Mrs. J.W. Merriman, Mrs. Dan'l Wheeler, Mr. and Mrs. W.A. Kelly, Mr. James Brittiny and his Mother Mrs. Lydia Lyttle and her Mother Mrs. Dora Merriman, Miss Daisy Merriman, Master ? and Harry Merrimaan and six of the Hopkins family were all here to our new years dinner, a grand good time. January 2, 1882 (monday) helping J.W. Merriman to kill 3 hogs, home after dark. January 3, 1882 (tuesday) went to town. Mr. and Mrs. Wheeler and I. Settled with Mr. E.F. Sperry. January 4, 1882 (wednesday) was up to Mr. J.W. Merrimans cutting wood this a.m. Mr. and Mrs. Wheeler was there. January 5, 1882 (thursday) took team and bobs and drew a load of goods to the cars for James Brittiny. He and his Mother moving to Illinois. 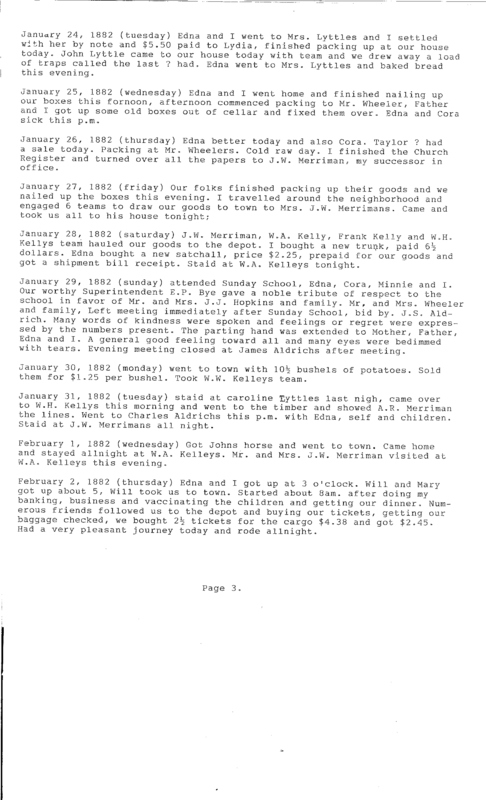 January 6, 1882 (friday) hitched up team to the bobs and went to Mr. J.W. Merrimans and got an organ box, called on J.S. Aldrich. Mr. and Mrs. Wheeler was here this p.m. J.S. Aldrich, Mr. and Mrs. Wheeler was here this pm. C.S. Aldrich was here and got some potatoes and Mr. T. Kelley was here and got corn and potatoes and brooms. January 7, 1882 (saturday) Edna, Father and I went to town with what little wheat we had left in our bins. I had 8 bu. and it sold for $9.20. Edna got a new dress. Got a letter from Mr. A.R. Byers and we got our sale bills and trunk. January 8, 1882 (sunday) Mr. Frank Caldwells, two children, died, the oldest one at 7:30 and the next at 12:30 aged 2 and 3 years old. Edna and I were there all day careing for the sick and afficted. January 9, 1882 (monday) J.W. Merriman came and we made an estimate of the shock corn. He drew home 26 shocks, two loads. Went over to Mr. Wheelers in the evening. Warm pleasant day. January 10, 1882 (tuesday) went to knoxville. Ednas father, Franklin and I bought a new suit of clothes of John Reed, coat, vest and two pair of pants, $21. Father also got a new suit $14.50. Mrs. Lyttle and Lydia came home with us. Got home late. Posted bills. January 11, 1882 (wednesday) snowed a little last evening. I rode "Nel" across White Brest Creek this morning and pasted up some bills of sale on the Pleasantville and Knoxville road and this p.m. Thad Kelly went with me to Adam Hays and there we saw Alexander ?. January 12, 1882 (thursday) I went with father to Mr. Thompsons place and got 6 bushels of corn. He took his mare home. Lydia went to Literary at the Burr Oak School House this evening. January 13, 1882 (friday) Harvey Bennett was here and bought all of my late Rose Potatoes and Mr. Wheelers late and early rose. Reub. Merriman came here and I sold him 6 bushel. Eld W. D. Swaine came here and we went to attend business meeting at the Church. J.S. Aldrich and J.G. Ritchie were in attendance. January 14, 1882 (saturday) cold frosty night. Brother Swaine staid all-night with us. We sat up til 11 pm. transcribing the records from the old Church Book on to the new register. Today we spent nearly all day writing and posting up the New Book. Reuben and J.W. Merriman came here with two loads of new furniture from Illinois. J.A. Merriman refused to give up 3 blackwalnut trees, but I made him come to time. 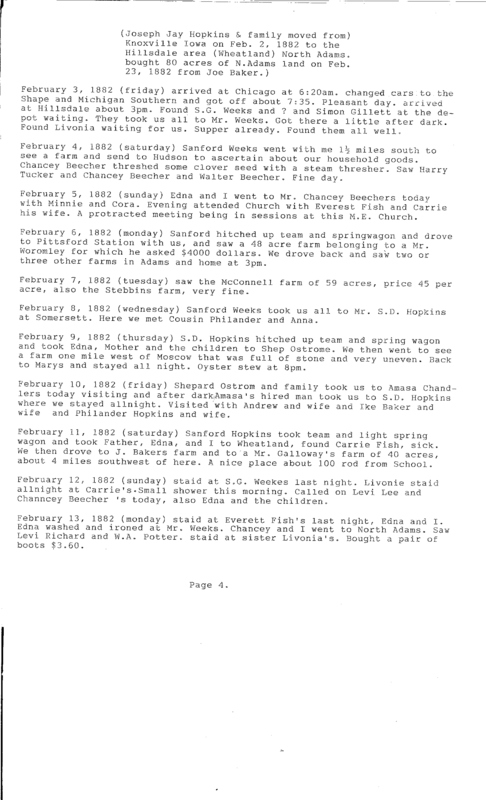 January 15, 1882 (sunday) attended sunday school at 10am and at 11 W.D. Swain preached the funeral sermon of Mr. Frank Caldwells two children who died last Sunday. After meeting Mr. James Aldrich and Charles Gray were immersed in the White Brest north of here. Day damp and chilly. Mr. Kendall and daughter was here to dinner. January 16, 1882 (monday) J.W. Merriman was here all day helping me to fix for the sale which we expect to come off tomorrow. Mr. Wheeler drew his goods over here. The Assessor was here and assessed my personal ($1000). Cold raw day today. January 17, 1882 (tuesday) Father and I sold a good many of our household goods at auction at our house, 6 cows, 3 calves, 28 sheep, one span of horses harness and wagon farming implements, 250 bushel of corn, hay and ?. R. Byers auctioneer. January 18, 1882 (wednesday) was at house. Taylor Kelly came and got 50 bushell of corn today. 72 cents a bushel. Business meeting at the Church at 10am. J.S. Aldrich and J.G. Ritchie made some acknowledgements after which there was a general good feeling and hand-shaking. January 19, 1882 (thursday) Mr. Joshua Asborne drew 15 bushel of corn away today. Mr. Henry Bell got 50 bushel of corn today (72 cents per bushel) I went to Mr. Ben Autens today with Joshua Osborne. January 20, 1882 (friday) was at our old home today attending to the sale fo corn. Mr. Joshua Osborne took away 50 bushell at 69 cents per bushell and Mr. Chancy Smith 52 bushel at the same price. Edna and I went to J.S. Aldrichs and staid all night. Edna sat up all night with Melissa. January 21, 1882 (saturday) was down at our old home making boxes and assisting Mother and Edna in packing our goods. Mr. J.W. Merriman brought a new book "Stove, the Iron Acorn" and some furniture. Cold raw day. January 22, 1882 (sunday) pleasant morning. Went over home and fed "Majs" his breakfast. We all went to S. School at 10am. Social Meeting immediately after Sunday School, after which we came to Father Wheelers and wrote out a letter for Sister Lucy Cooper and done some coping in the new Church Register. January 23, 1882 (monday) Father and Mother Wheeler went yesterday after meeting to Mr. Elias Fullers, than staid and hugged Charity all night. We were all at our house packing up today. The bell from Mr. Wheelers took off sometime in the night, (clock), and was running wild this am. We got up at 2:30 a.m.
January 24, 1882 (tuesday) Edna and I went to Mrs. Lyttles and I settled with her by note and $5.50 paid to Lydia, finished packing up at our house today. John Lyttle came to our house today with team and we drew away a load of traps called the last ? had. Edna went to Mrs. Lyttles and baked bread this evening. January 25, 1882 (wednesday) Edna and I went home and finished nailing up our boxes this fornoon, afternoon commenced packing to Mr. Wheeler, Father and I got up some old boxes out of cellar and fixed them over. Edna and Cora sick this p.m.
January 26, 1882 (thursday) Edna better today and also Cora. Taylor ? had a sale today. Packing at Mr. Wheelers. Cold raw day. I finished the Church Register and turned over all the papers to J.W. Merriman, my successor in office. January 27, 1882 (friday) Our folks finished packing up their goods and we nailed up the boxes this evening. I travelled around the neighborhood and engaged 6 teams to draw our goods to town to Mrs. J.W. Merrimans. Came and took us all to his house tonight. January 28, 1882 (saturday) J.W. Merriman, W.A. Kelly, Frank Kelly and W.H. Kellys team hauled our goods to the depot. I bought a new trunk, paid 6 1/2 dollars. Edna bought a new satchall, price $2.25, prepaid for our goods and got a shipment bill receipt. Staid at W.A. Kelleys tonight. January 29, 1882 (sunday) attended Sunday School, Edna, Cora, Minnie and I. Our worthy Superintendent E.P. Bye gave a noble tribute of respect to the school in favor of Mr. and Mrs. J.J. Hopkins and family. MR. and Mrs. Wheeler and family, Left meeting immediately after Sunday School, bid by. J.S. Aldrich. Many words of kindness were spoken and feelings or regret were expressed by the numbers present. The parting hand was extended to Mother, Father, Edna and I. A general good feeling toward all and many eyes were bedimmed with tears. Evening meeting closed at James Aldrichs after meeting. January 30, 1882 (monday) went to town with 10 1/2 bushels of potatoes. Sold them for $1.25 per bushel. took W.W. Kelleys team. January 31, 1882 (tuesday) staid at Caroline Lyttles last nigh, came over to W.H. Kellys this morning and went to the timber and showed A.R. Merriman the lines. Went to Charles Aldrichs this p.m. with Edna, self and children. Staid at J.W. Merrimans all night. February 1, 1882 (wednesday) Got Johns horse and went to town. Came home and stayed allnight at W.A. Kelleys. Mr. and Mrs. J.W. Merriman visited at W.A. Kelleys this evening. February 2, 1882 (thursday) Edna and I got up at 3 o'clock. Will and Mary got up about 5, Will took us to town. Started about 8am. after doing my banking, business and vaccinating the children and getting our dinner. Numerous friends followed us to the depot and buying our tickets, getting our baggage checked, we bought 2 1/2 tickets for the cargo $4.38 and got $2.45. had a very pleasant journey today and rode allnight. February 3, 1882 (friday) arrived at Chicago at 6:20am. changed cars to the Shape and Michigan Southern and got off about 7:35. Pleasant day. arrived at Hillsdale about 3pm. Found S.G. Weeks and ? and Simon Gillett at the depot waiting. They took us all to Mr. Weeks. Got there a little after dark. Found Livonia waiting for us. Supper already. Found them all well. February 4, 1882 (saturday) Sanford Weeks went with me 1 1/2 miles south to see a farm and send to Hudson to ascertain about our household goods. Chancey Beecher threshed some clover seed with a steam thresher. Saw Harry Tucker and Chancey Beecher and Walter Beecher. Fine day. February 5, 1882 (sunday) Edna and I went to Mr. Chancey Beechers today with Minnie and Cora. Evening attended Church with Everest Fish and Carrie his wife. A protracted meeting being in sessions at this M.E. Church. February 6, 1882 (monday) Sanford hitched up team and springwagon and drove to Pittsford Station with us, and saw a 48 acre farm belonging to a Mr. Woromley for which he asked $4000 dollars. We drove back and saw two or three other farms in Adams and home at 3pm. February 7, 1882 (tuesday) saw the McConnell farm of 59 acres, price 45 per acre, also the Stebbins farm, very fine. February 8, 1882 (wednesday) Sanford Weeks took us all to Mr. S.D. Hopkins at Somersett. Here we met Cousin Philander and Anna. February 9, 1882 (thursday) S.D. Hopkins hitched up team and spring wagon and took Edna, Mother and the children to Shep Ostrome. We then went to see a farm one mile west of Moscow that was full of stone and very uneven. Back to Marys and stayed all night. Oyster stew at 8pm. February 10, 1882 (friday) Shepard Ostrom and family took us to Amasa Chandlers today visiting and after dark Amasa's hired man took us to S.D. Hopkins where we stayed allnight. Visited with Andrew and wife and Ike Baker and wife and Philander Hopkins and wife. February 11, 1882 (saturday) Sanford Hopkins took tem and light spring wagon and took Father, Edna, and I to Wheatland, found Carrie Fish, sick. We then drove to J. Bakers farm and to a Mr. Galloway's farm of 40 acres, about 4 miles southwest of here. A nice place about 100 rod from School. February 12, 1882 (sunday) staid at S.G. Weekes last night. Livonie staid allnight at Carries's. Small shower this morning. Called on Levi Lee and Channcey Beecher 's today, also Edna and the children. February 13, 1882 (monday) staid at Everett Fish's last night, Edna and I. Edna washed and ironed at Mr. Weeks. Chancey and I went to North Adams. Saw Levi Richard and W.A. Potter. staid at sister Livonia's. Bought a pair of boots $3.60.